Get a 15 days free trial here with no commitment! Overall : 4.5/5 – Recommended! Is BackBlaze The Cloud Backup Service You’ll Ever Need? Online cloud backup services are like personal insurance plan. Both of them are terrible investments as far as ROI goes. And people realize why these services are around only when something bad had happened to the or to their personal data. Check out how you can reduce the damage on your valuable data for cloud backup vs cloud storage when facing natural disaster course. If you had seen the horrors of losing valuable data, you knew what exactly you are up to. There are many backup solutions to choose from especially the recommended Best Cloud Storage Here. From this bunch however, an online cloud backup service called BackBlaze ‘blazed’ through the competition. As of today, they had managed to backup and stored over 600 Petabytes of data. BackBlaze had just released their 2018 Hard Drive Reliability report based on manufacturer and the model of those particular hard drive that are in survey. Find out what those stats in 2018 tells you about hard drive failure rate. And as you’ll see in this review, BackBlaze’s popularity reached new heights for very good reasons. Right off the bat, BackBlaze tells you that the initial backup can take as long as 59 days to complete. This isn’t surprising at all – it’s the norm as far as personal backup services go. Check out who’s the fastest cloud storage at my little experiment here. So I ran my initial backup – 300GB of images, PDFs, ebooks, MP3s, and videos which most of us possess. I was expecting to complete the whole shebang in a week. Well, BackBlaze came back with a pleasant surprise. My 300GB-initial backup took only 3 days to complete (running days and nights). Reasons behind why Backblaze is fast. While I know that backup speed has a lot to do with my current bandwidth, BackBlaze isn’t the first backup solution I’ve sampled. Having tried many identical services, BackBlaze left them in the dust speed-wise. Once the initial backup completed, your files over the cloud are updated on a continuous, incremental basis. It only changes those files in your backup that are changed or modified on your PC. Check your bandwidth here to get an estimate time for you to backup your PC. *Backblaze claim initial backup usually takes up to 59 days! When emergency strikes and you need to perform restorations, you can opt to restore a single file; a folder; or all of your backed-up files at once through a downloadable zip file. BackBlaze’s system prepares it and will send you an email notification once the files are good to go. On the other hand, your backup’s total size might be bigger than you want it to be. And restoration through a downloadable zip file might take too long. In such cases, you may want to receive a USB thumb drive or USB hard drive with everything in it, and BackBlaze allows you to do that. For an additional fee, the guys at BackBlaze will send you the flash or hard drive through FedEx. Did you know BackBlaze can send you a hard copy of your backup for an additional fee? You may not be a company who has a lot of confidential documents and files to safeguard from prying eyes. However, with the level of security that BackBlaze provides, it’s as if you are one. Once your data is compressed, it’s encrypted using AES military-grade encryption. From there, your data moved to the cloud using secure SSL connection. You can even create your own private encryption key if you so desire. As far as file types go, you can backup about any format or type except application and operating system files. You can check out their website to see the full list of file formats that are not supported with the service. You can schedule the service to run at times that are most convenient for you (ex. : once a day). Alternatively, you can choose the continuous option especially if your files are updated numerous times throughout the day. Yes, you can change the speed settings manually but this is mostly reserved for advanced users. It’s so much easier to let BackBlaze do all the legwork in the speed-throttling department as their “FSCAN Engine” ensures that your PC works at the ideal speed while the data transfers are maintained at the fastest rate possible. What’s Bad For BackBlaze Backup? While BackBlaze has all the earmarks of a reliable personal backup solution, it’s not all rainbows and roses. For starter, it doesn’t have any file sharing capabilities or features. Which you see in other backup and file syncing services like Google Drive and Dropbox. Keep in mind too that BackBlaze isn’t capable of backing-up operating system and application files – making full and bare-metal restore impossible. Moreover, at the time of this writing, they only provide online support, which might alarm some users. So far however, BackBlaze’s online support has been very responsive in my experience. And last but not the least, file versioning is quite limited. Their service only keeps a file’s versions for the last 30 days. What is Backblaze B2 Cloud Storage? 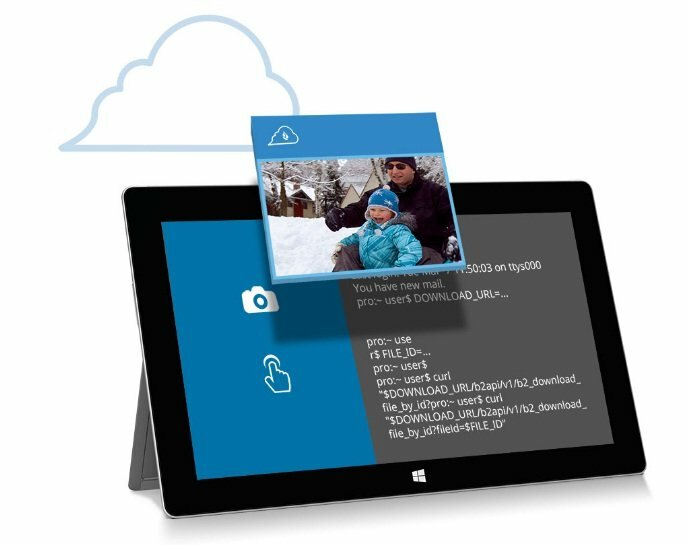 When you decide that you need cloud storage, you’ll quickly notice that it isn’t all that cheap. Until you run into Backblaze B2. Can it really be as cheap as it seems? Check out below and find out. Officially, Backblaze B2 is the cheapest high-performance cloud storage in the world. At the moment when there are cloud offers everywhere, Backblaze B2 came like a breath of fresh air. It’s ridiculously simple – one service level, one storage price $0.005 per GB per month, one price for downloads $0.02 per GB, and one simple list of your transaction charges available on a single pricing page. The biggest winning point is – you only pay for what you use, and the cost is almost ridiculously low. This isn’t like Google Drive, iCloud or Dropbox. No. This is the underlying storage that such services can be built upon. Just like Dropbox was built on Amazon S3. So if you need a comparison, this is like Google Cloud, Amazon S3, or Microsoft Azure, and it’s quickly catching up to these big players. You can use it for media and entertainment, LTO migrations, cloud migrations, backup and etc. Doesn’t matter if you own a startup, a TV station, or an accounting company, you can store your data on B2, and quickly access it at any point in time. Well, if you’re one of us common people, you can use B2 to upload, store and share files online. If on the other hand, you’re a developer, you can use B2 for the storage your apps might need through the RESTful API. If you’re in IT or tech field, B2 can be a great place for storage of corporate data, backup servers and much more. This service has a simple web interface that lets you upload, download and share files easily. Also, it alerts you when you approach the storage limit you set for yourself, so there can be no surprise charges. The first 10GB of monthly storage is free, and the first 1GB of downloads every day is free. The uploads are also free. You pay only for what you use, and at the price of $0.005 per GB of storage, and $0.02 per GB for downloads. When you compare Backblaze B2 with similar services, Amazon S3 is 320% more costly. Microsoft Azure is 260% and Google Cloud 300% more expensive. Find out the simple pros and cons for the B2 cloud storage here too. This company doesn’t beat around the bush when it comes to pricing their services. At $5/month (or $50/year $95/2 years), BackBlaze is very budget friendly. For less than a hundred bucks, you can keep just about every file you have safe and sound for 2 years while other online backup services cost 2 to 3 times as much. And that’s it as far as the backup plan goes! There are no complicated tiers or membership levels – making it easier to find the cost range you’re comfortable with. Yes, there are options when you need them. But they’re very easy to understand. 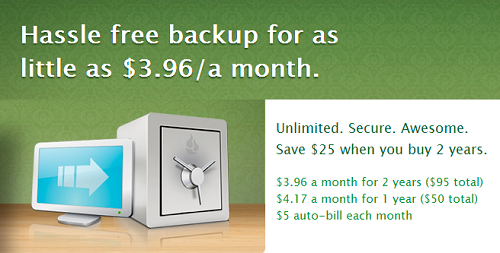 Did you know it's only $5/mo for unlimited online backup? Conclusion: Is BackBlaze The Well-Rounded Unlimited Cloud Backup Options? Weighing both its pros and the cons, BackBlaze’s backup service is certainly the most if not the only best cloud backup option on the market nowadays.. I will recommend this to anyone who needs an affordable but reliable backup service without a second thought. There are a lot of things I loved about the service. For instance, they are one of the few companies out there who doesn’t bombard their free trial users with daily emails and popups during the trial period. Experience it yourself during the 15 days trial. They also did not offer any free cloud storage at this stage. Although B2 cloud storage offer 10GB free storage, but they are charging $0.01/GB download price for the next subsequent GB (First 1GB download is free). Unless you’re looking for an enterprise-grade backup and disaster recovery service, BackBlaze’s backup service is feature-packed and reliable enough to keep your PC’s data safe, sound, and easily recoverable. It’s an excellent pick especially for users who want a ‘set it and forget it’ backup solution that they can easily turn to in case of emergencies. But don’t take my word for it. BackBlaze offers a 15-day trial period…of the full service if I may add. Take it for a test drive and let me know what you think. If you cannot make up your mind, check out my Backblaze vs pCloud research here. Did you know that BackBlaze offer Prorated refund policy? Backblaze backup plan backup PC or Mac desktop computer while B2 Cloud Storage can use it for any computer, any OS or any cloud storage purposes. Charges for B2 is based on usage while the Backblaze Backup is “unlimited”. All your data eventually. All your external drives that connect to your PC or Mac. It does not backup NAS or folder share from another computer. YES. There’s absolutely no cap! You can backup anything. Unlimited and unthrottled backups is the main point. While you do not have to worry as Backblaze backup everything by default. Everything except the Operating System, applications, and others such as trash or cache folder. NO. There’s no restriction on file size. But Backblaze will prioritize smaller file to be uploaded and backup them first. If you pick web download option which is free and are using DSL cable, the download speed is approximately 1GB/hour. If you pick USB delivery, it normally takes 3-10 days depending on your restoration size. There’s no refund on the monthly plan. However if you subscribe the yearly plan, you can request a full refund within the first 30 days of your subscription.